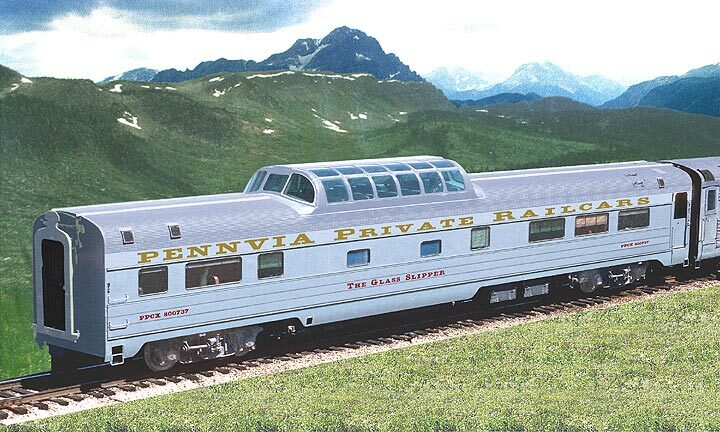 Ideal choice for day trips or in combination with a sleeping car. Fourteen swivel lounge seats under dome glass canopy, a main-level lounge sofa seating for 12, a full kitchen that supports formal dining for 24 at 6 tables, one master bedroom, shower, washer and dryer. Classic 1950’s interior, restored to original ambiance; lighted stair rails, inlaid Northwest Indian murals on main-level end walls. Indian motif extends to main-level lounge furniture. Equipped for push-pull operation. Budd-built in 1955 as CB&Q 1333 for the “Empire Builder.” To Burlington Northern in 1970. Became Amtrak 9473 in 1971. Leased to Alaska RR 1984-85. Acquired by PENNVIA in 1993. Leased to “Liberty Limited” dinner train 1996-2001. Upgraded in 2017.